The idea of having a 360 degree view of the entire job seeking and matching landscape has always been a dream of any labour economist. Just imagine, a dataset of CVs and job seekers matched with job advertisements and openings! The potential of such a dataset to answer existing questions on the labour market is incredible. One could investigate market power between worker and firms, information asymmetry within the matching process, or find out new growth clusters and skills needed to support these areas. So it was slightly unfortunate that I was not able to get my hands on such a dataset during my time in the government (I believe only Linkedin could capture something close to what I described). A few months ago, I decided to make some steps towards creating that dream dataset. While getting information on the candidate side is near impossible, data on job openings are readily available through job portals. Over a few weekends, I wrote a scrapy bot to crawl and save job postings from one major Singapore based job portal.1 Having collected a full month of data for October, I thought it was a good opportunity to carry out an exploratory analysis of the dataset. This post features that analysis along with some tidbits of the Singapore hiring landscape. If anyone is interested in studying this dataset in more detail, feel free to drop me an email! The job posting data is collected on a MySQL database and I will be using R along with the dbplyr package to explore the dataset. To interface with the backend database, I am using DBI to create a connection to it. For this post I created a slightly modified copy of the data in a table called sg_jobs_tbl. For reference, the main fields that were scraped are the job title, posting date, company, post type (sponsored or not), occupation (called tag in the database), job description, experience required, company’s address, company’s industry and a brief overview of the company. We have more than 50,000 postings in a month, but how many of them are from recruiting agencies or direct job openings? We can filter out firms with ‘recruitment firm’ as part of their company description to derive the count of postings by actual companies. Apparently more than 50% of all job posts are by recruitment firms. This means that we have to be a little careful of the data quality since firms might spam the job board with multiple posts across the month for a single job opening. Does ST Electronics really need 32 carpark officers? Let’s take a look at the date which these offers are posted. The first 5 entries are recruitment firms with ST Electronics making up the rest of the top 10. Which firms are hiring aggresively in October? Not surprisingly, we have the government linked companies high in the list with NUS, ST Electronics and UOB in the top 3. The list also gives a preview on which industries have a shortage of workers and the skills that are in demand, namely, healthcare, engineering and IT. Which industries have the most vacancies to fill? Let’s examine the difference between the job posting statistics and the official employment numbers as published by the Department of Statistics quarterly statistics (You can take a look at my SG economy dashboard). Certain industries such as transportation, banking, education and healthcare are in line with the national employment trend. Interestingly, there is still quite a strong demand from the construction and manufacturing industry despite the negative outlook within those sectors. The discrepancy could be a result of structural mismatch between the workers that are laid off and the type of workers which those firms are looking to hire. How does firm size correlate with hiring? 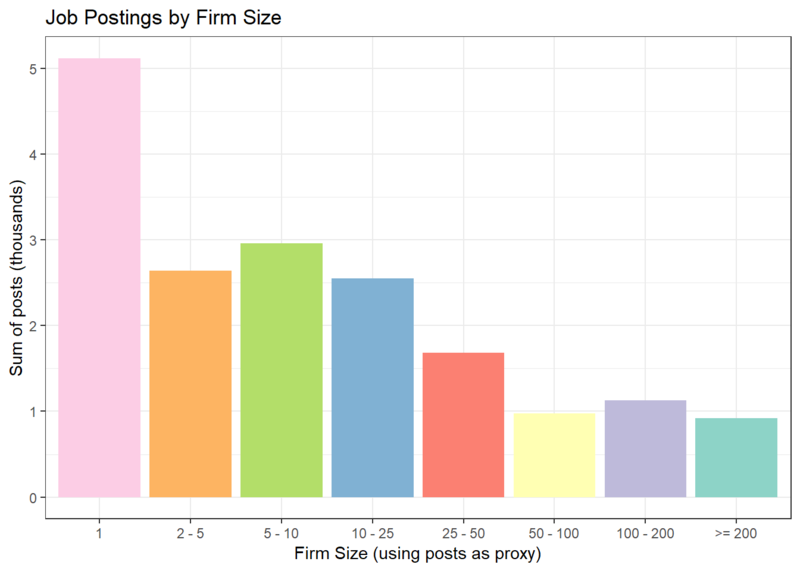 We can use the number of post as a proxy for the size of the firm (larger firms have more open positions). Firms which are aiming to hire less than or equal to 10 people, contribute to more than 50% of the total potential hiring. There are about 5000+ firms looking to fill only a single vacancy. Which job positions are most in demand? Most of the positions are generic titles or business support positions that cut across industries. In total, there are more than 6,000 unique occupations listed. Recruitment firms vs direct openings? The fractions in the table above refers to the fraction of jobs that are posted by recruitment firms. From the first table, we see that a lot of admin and IT related positions are typically filled with the help of recruitment firms. Companies prefer to source for more senior positions directly and they tend to use more generic titles when creating job openings. 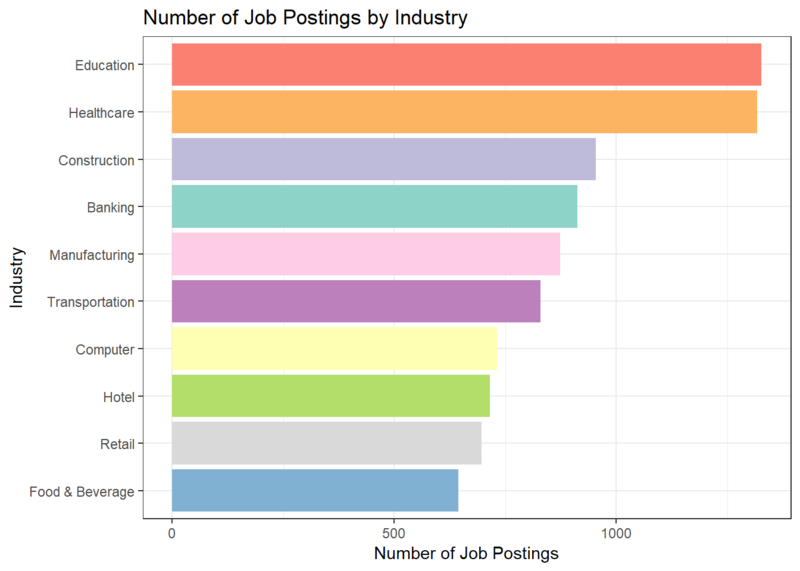 This post is a first look at a dataset of job openings. Besides the fields discussed in the exploratory analysis, there remains two other free text fields, job description and company description, which could be analysed in greater detail. I have many other ideas to explore with this dataset so do check back or subscribe to the RSS feed for future updates.